In conclusion, the WFPC2 images of M16 are visually striking, and noteworthy from that perspective alone. They also provide a fascinating and enlightening glimpse of the physical processes at work in the interplay of massive stars and their surroundings. The Pillars of Creation are located in M16 (also known as the Eagle Nebula), a nebula 7000 light-years away and 14 light-years in size. 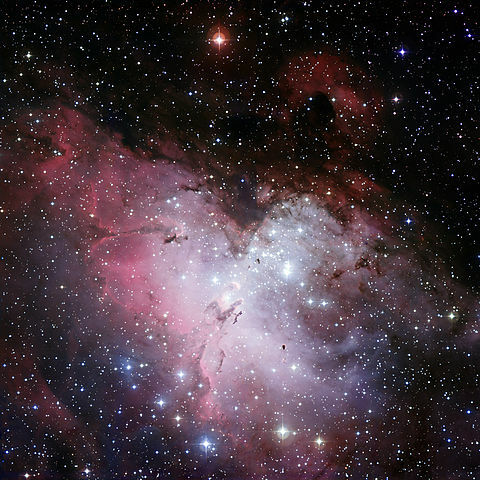 The Eagle Nebula used to be just a cloud of cold gas, until some of that gas collapsed and formed hot, bright O stars. These stars ionized and heated the gas around them, making the gas expand. 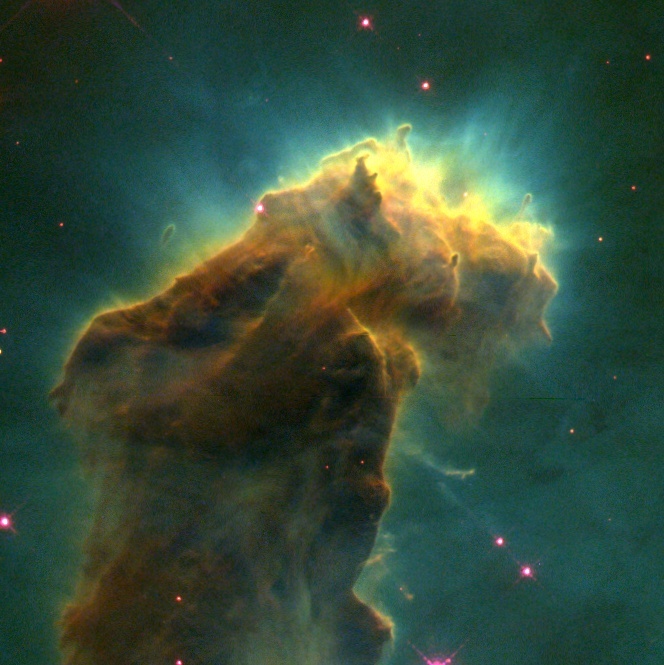 What we see today is this hot gas colliding with the surrounding cold gas that has not yet been heated by the stars. These collisions compress the cold gas even more, which will cause more stars to form. From the Pillars of Creation, Hester et al. came to two conclusions. The first was the existence of a photoevaporative flow: as the surrounding cold gas is heated by the O stars, it flows into the hot gas. The second was the existence of EGGs (Evaporating Gaseous Globules) and their identities as globules of gas about to form stars. But how are astronomers able to learn so much from a single image? This site will guide you through the process. If you are unfamiliar with physics at an undergraduate level, you may want to read about the basics of the spectrum and energy levels before taking a first look at the “Pillars of Creation”. If you are have studied or are studying physics at an undergraduate level, you may want to read the details of modelling nebular structure instead, before taking a closer look at the “Pillars of Creation”. Finally, you can try the nebula predictor to see how The Pillars of Creation would look different if the properties of the hot stars and the nebula were changed. This site was created in May 2013 as a final project for Astronomy 201b: Interstellar Medium and Star Formation taught by Prof. Alyssa Goodman. The author, Stephen Portillo, is a first-year PhD student in Astronomy and Astrophysics at Harvard University, working on indirect detection searches for dark matter under the supervision of Prof. Douglas Finkbeiner.